Who is it for? 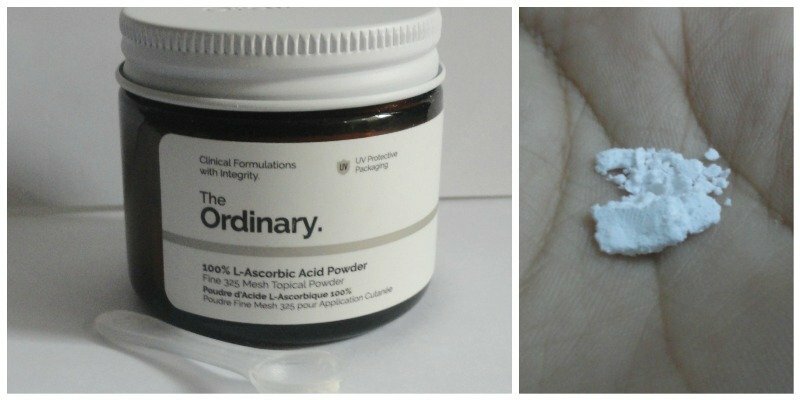 The Ordinary L Ascorbic Acid Powder is for anyone with dull and lifeless skin and tired of spending buckets of money on Vitamin C serum. It comes in a dark glass tub with a small spatula for measuring. It is a Fine 325 mesh tropical powder. It is white in color and very fine texture which dissolves immediately. An antioxidant serum is very effective for skin especially Vitamin C. I have used Vitamin C Serums before but had to finish them quickly as I was scared of them degrading. As a result, I used up a lot of product and ended up with clogged pores. The powdered form of Vitamin C has both pros and cons. On the one hand, it is easy to make a small batch and test it. If your skin does not like it then make another one. On the other hand, we are not Cosmetic Chemist and it is very easy to go overboard and burn your skin. It is very important to keep in mind the percentage of powder used. This thing is potent as hell, so try with making a 5% mixture and then move up. Use the spatula to measure the quantity. For example, to make a 10% potent serum use one spatula of powder and mix it with 9 spatulas of other serum/water/glycerin. I mix it with Hyaluronic Acid 2% by The Ordinary. It worked really well on my skin for the first month. I had brightened and even skin. It cleared my old acne scars to an extent. But it all went downhill after that. I thought my skin could handle a more potent version, but it could not. I had dry patches and redness on my face. I had to take a break from vitamin C and pumped my skin with moisturizers. Took about 2 weeks to get rid of dry patches and then again included this in my skincare regime. Now I do not exceed the 15% limit. An only a little amount is required to make a batch, so it is going to last long. The Ordinary has a lot of products with Vitamin C. I would like to try them first.